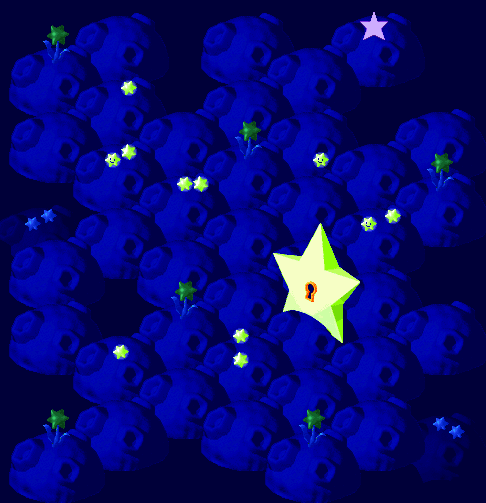 You have now collected the third star, but are still stuck somewhere deep in the mine. Follow the train tracks and you'll find Dyna trying to get a mine car to work. Mario agrees and looks a last time back where a short warning is. Read it (or ignore it) and enter a small minigame. There are mushrooms on the way which you can collect by jumping. They make you go faster temporarily, but watch out so you don't suddenly derail at a turn. You can also use the control pad at junctions to tell the mine car where to go. Mario, Dyna and Mite come in crashing through the ceiling. You'll be thanked by the family for bringing their kids home. As soon as you leave, you'll see three snifits attempting to catch a beetle. They're also talking about how Booster is busy entertaining his "princess from the sky"... In any case, go to Booster Pass. This is a simple passthrough region. The first area has a Lakitu dropping Spikesters, so it's a good area to grind in if you feel you need some more EXP. There are also Artichokers all over the place, but watch out as some are actually enemies with powerful special attacks. When you do win against them, though, you occasionally get Fright Bombs, which are good items which put Fear status on an enemy and on top of that do 100 damage. If you need to rest, just go back to Rose Town and go to the inn, it's for free. As soon as you enter the area you will see two plants. Go to the one on the right and check it to find a free Frog Coin! Climb up the mountain. To the left of the passageway is a hidden Treasure Box with a Rock Candy inside. Rock Candy does 200 damage to all enemies in battle, so it's good to have for late game. In the next area, there are Spikesters in holes. Go around the mountain and into the small alcove, where there's a hidden green switch which fills the holes, killing all the Spikesters. In the corner is a flower for you to collect. Now climb the mountain and go through to Booster Tower. A cutscene will start right at the beginning. Bowser is standing in front of the tower with no troops left, while the Princess is up on the balcony of Booster Tower. Mario catches him in surprise, and as he sees Toadstool, he decides to leave. Now go to the door and try to open it, note that it's locked. Now go back and Bowser will rush to you. He knows you need something and breaks open the door for you. After that, Bowser decides to join your party! Since you can only have three members in battle, you'll also get a tutorial on how to switch allies if you want. Now, give Bowser the remaining Work Pants, switch Mallow with him and give Bowser one of the pins, and enter Booster Tower. If you want a battle you can talk to the Snifit right ahead. Otherwise, climb the stairs and go through the upper passageway. Climb the stairs there, avoiding the Spookums marching by, and you'll reach another room. Here, Booster comes and greets you to his tower, but as he is busy, he decides to leave you alone. Follow the train tracks into an alcove to get a Flower Tab (if you try to follow Booster you'll just get into another battle), then go to the next room. Here, climb the stairs while avoiding the Rob-Ombs patrolling here. You'll now see two exits, take the right one. This one is a challenge. Jump down just right on the teeter-totter so the Bob-omb will be thrown upward, fall down and launch you up the the Treasure Box. If you miss you need to walk all the way up the tower again. The Treasure Box contains the Masher, which is a new weapon for Mario (as always, equip it). Now, climb the tower again to where you were before, and take the left exit this time. Here you'll find a green switch, press it and there will be a large quake. Now, just follow the passageway into the next room, go through that one too as it's empty. However, if you go behind the curtain, Mario fans of old will get a nice surprise! In this room there are Spookums standing on platforms you need to jump across. You can either fight them or just ignore them and jump across on the side of the platform. On the top, avoid the bullet bills and go through to the next room, where you again need to climb a series of stairs while avoiding Rob-Ombs. The next room contains a save point so save your game, then continue. This room contains a small puzzle. You need to examine the pictures in the correct order. If you remember the order of the pictures at the very beginning of Booster Tower this should be easy. The order is randomly generated, however, so there is unfortunately no short-cut other than to memorize/write down the pattern. When you succeed, you'll get an Elder Key, use it to unlock the door right next to the pictures. In this room jump to the Chomp, Bowser will then detach it and use it as a weapon. This Chomp is a weapon for Bowser (you still need to equip it yourself). Once you're done return to the pictures room and proceed. Here, climb the structure. There's a Treasure Box at the right end that contains a Recovery Mushroom, now jump on the teeter-totter to be launched upward. The next room features paratroopers dropping from above. Grab a Frog Coin from the hidden chest in the far-left corner, and check the alcove for another hidden Frog Coin. The next room is another puzzle - each wrong step will trigger a battle. You must get the key and then move to the locked door. Inside you'll find a Treasure Box containing the Zoom Shoes. Now, get to the other passageway and go through. Climb the stairs while avoiding the Chomps. ...well, almost. The door is locked, and Booster is coming back. Mario decides to hide behind the curtains while Booster and his Snifits are looking for the missing Mario doll. Booster tells the Snifits to look behind the curtains, which starts a minigame. You can either be caught (in which case you have to battle against Booster himself) or successfully hide. Once you've successfully hid from the Snifits, Booster will find the Mario doll on top of the curtain, but then cry because he cannot reach it. Jump to retrieve the Mario doll, and he will thank you and give you the Amulet, a great accessory that increases all main stats by 7, but reduces speed by 5. Equip it if you wish, then go back and save because outside, a miniboss approaches! Geno should cast Geno Boost on Mario (if you time it correctly you also get a defense bonus, which is definitely useful), while Bowser uses Terrorize to inflict fear status on both opponents. You should first concentrate your efforts on Knife Guy, he is the weaker of the two and if you don't get rid of him quickly, the minibosses will jump onto each other, making things really difficult. Mario should use Fire Orb or Super Flame against Knife Guy, while Bowser attacks and Geno heals or attacks as well. Against Grate Guy, everyone should attack physically. You may need to heal once or twice but in total, it should not be hard. Now a minigame will automatically start. In this minigame you must try to reach Booster by jumping off the barrels (and the Snifits later) using . Every time you touch Booster, you get a flower. If you're good you can easily get ten flowers or more in this minigame. Once you're at the top, you'll automatically enter Marrymore. Staying in the suite can be expensive--especially if you make the mistake of resting for more than one night! But staying there can be lucrative. The first time you stay in the suite, the manager gives you the gift of a Flower Tab. Tip the bellhop during your stay, and you will receive a Mid Mushroom at the end. And you can even make back some cash with a little arbitrage: the KeroKeroColas on offer from the drink menu are just 150 coins--50 coins less than their selling price. Just don't overextend your wallet; instead of refusing you service, the management will make you work as a bellhop for other guests. While the suite is the more interesting stay, the regular room can be valuable as well--hidden above the bookshelf on the left side of the screen is a hidden chest with a Frog Coin inside. Marrymore is a large town where marriages are made (as the name says). For now, just run straight ahead to the hotel. It has two rooms: a cheap one for 10 coins, and an expensive suite for 200 coins which has a shower and allows you to buy some drinks while you're inside. Note if you can't actually pay the drinks, you'll be forced to work in the hotel to pay it off (don't do it). Anyway, it also has an item shop which has some goodies. Buy the Happy Shirt and the Happy Pants, ignore the other two. The Super Hammer and Chomp Shell are inferior to the Masher and Chomp so ignore them as well. Buy the Hand Gun and the Whomp Glove though, and equip everything. Now, go to the castle and talk to the people waiting outside. Watch as Raz and Raini get thrown out of the castle while the Snifits lock the door. Walk around the castle and you'll find a backdoor. Go through the kitchen and into the main room, where the Snifit notices you're there. He tries to tell Booster as he realizes the door to Booster is locked as well. So help him break open the door and he will rush in. Anyway, the next door will also be swiftly locked, but Bowser has no problem breaking it open. (Save at the save point beforehand if you want) This causes Toadstool to lose all her accessoires. You must talk to the three Snifits to get the three accessoires, then jump on Booster's head to get the last one. Afterwards, talk to Booster and depending on how well you performed, something will happen now. The two Chefs are invincible so don't bother with them. Cast Geno Boost on Mario, then attack the cake with physical weapons until the two Chefs run off. Now, five candles will light up, and you must blow them out by attacking, so constantly attack him. The candles will turn on again when he attacks, so you must not take a break. Once you have killed Bundt, only the Raspberry remains. It is weak against Jump, so use Super Jump continuously until it dies, and heal when your health goes low. When you have beaten the Raspberry, a cutscene will show Booster eating the Raspberry in one big gulp, after which the battle is over. Go into the castle and make your way to the Chancellor. Mario will now show the Chancellor his new allies, who will tell you to go and defeat Smithy. The Princess says she needs a short break, so let her leave and go outside. As soon as you arrive outside, Toadstool will be hovering down using her Parasol, and decide to join your team after all. You can either put her into your active party or leave her out - she has superb healing capabilities but that's it. In any case, as Toadstool asks where the next Star Piece could be, Mallow suggests asking Frogfucius, so return to Tadpole Pond. Simply go across to Frogfucius' island and talk to him. He will tell you a star has been sighted on Star Hill. So return and go to Star Hill (on the World Map, it's to the west of Marrymore). First of all, go to the far left, examine the star so the door will open, and go through. Here, you can talk to the green smiling stars to read about other people's wishes. There are some quite powerful monsters on Star Hill, so avoid battles whenever possible. Especially the Pulsar is dangerous because it selfdestructs as soon as you attack it, leading to instant death. Your job in every area is to find all the stars to open the door leading to the next area. The locations of the stars are shown on the map to make it easier to find them. This area is small so it should be no problem to activate all the stars to get into the next area. This area is larger than the previous one. There are some quick enemies here, as well as ones that just pop out of the floor, so watch out. Again, activate all the stars and go through the door to go into the next area. In the last area, the Star Piece is in the northeast, just lying there for you to collect. There's not even a battle involved! 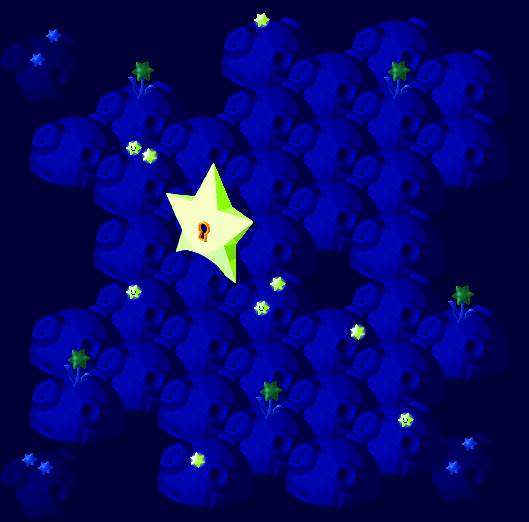 Anyway, activate all the stars to leave Star Hill. Your next destination is Seaside Town. This page was last edited on 19 March 2019, at 02:18.